BY THE time the 1990s rolled around, legendary Queensland Rugby League chairman Ron McAuliffe had passed away. Yet the visionary, who served a decade in the federal government and was known affectionately as "the Senator'', had already sown the seed for what would arguably become the most damaging confrontation in the history of the greatest game of all. Ask anyone at the coalface of rugby league in the mid-1990s and it's odds-on they will claim the advent of Super League almost killed the game. And, unwittingly at the time, your columnist became front and centre in revealing the media-driven revolution that turned away many rusted-on fans - some of them forever. As Queensland editor of the now-defunct Rugby League Week magazine, my first brush with the words "Super League'' came at the end of the 1984 season when Senator McAuliffe, the Queensland Rugby League chairman at the time, confided in me that the formation of a streamlined national competition was "a must". 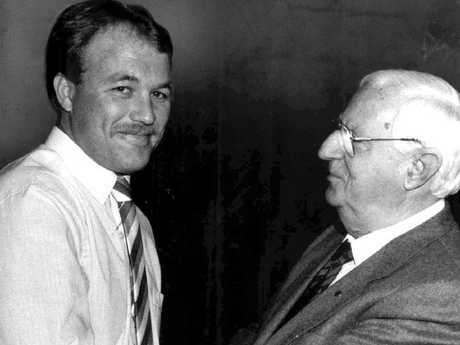 Wally Lewis with Ron McAuliffe, who the former player said offered him a place in the National Party in the 1980s. Another prophet of the breakaway competition was a former Broncos chairman, the late Paul Morgan. In March 1994, RLW published a story headed World Series League, after the man known as Porky told me a competition similar to the revolutionary World Series Cricket was "on the cards". 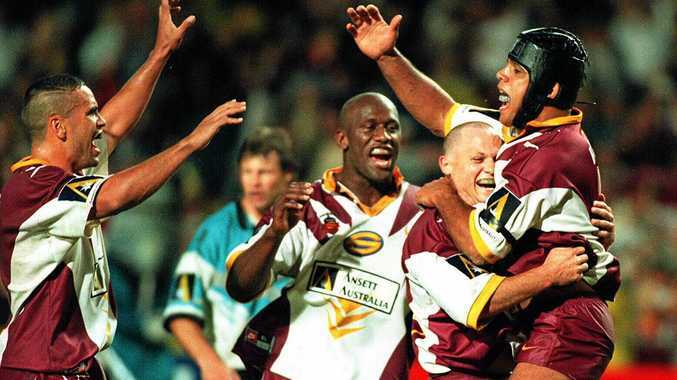 The Broncos, premiers in '92 and '93, and the ARL had been at loggerheads over a number of issues. 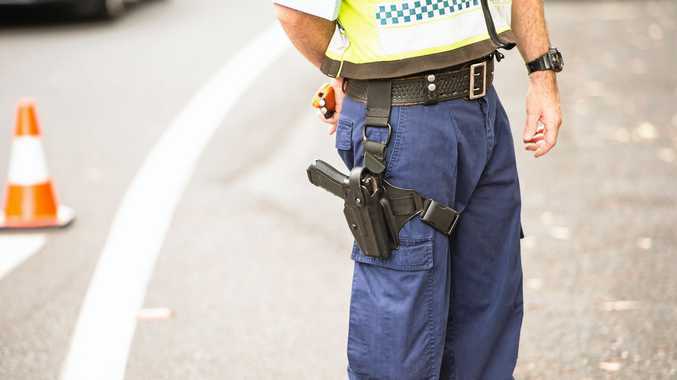 At the time, the Brisbane club had just signed a major sponsorship agreement with News Corporation for an unheard of $2 million a year. Ironically, it was News Corporation that would back Super League. News of that breakaway competition broke on April Fools' Day, 1995, with eight ARL-aligned clubs signing up. The Broncos, Bulldogs, Cowboys, Panthers, Raiders, Sharks, Warriors and Western Reds were joined by new franchises in Newcastle (Mariners) and Adelaide (Rams). And, as expected, all hell broke loose. Super League almost quadrupled the salaries of some players such as the Canberra Raiders' Bradley Clyde. A virtual war was suddenly activated between two media giants whose primary interest in the game was the imminent arrival of pay TV. As a result, clubs, players and fans simply became pawns in a much bigger game than rugby league. 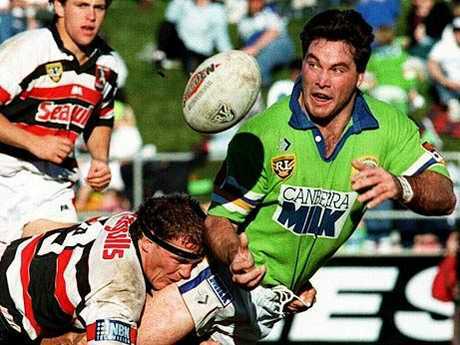 Court action launched by the ARL prevented Super League from starting until 1997, and then it lasted just one season before a peace deal resulted in the formation of the current NRL competition. But while the fans were those most disenfranchised by the war, for the players it was Gold Lotto time. Those at the top of their game - Allan Langer, Brad Clyde, Brad Fittler and Paul Harragon - quadrupled their annual salaries to about the $600,000 mark. And the combined cost to the two media companies? An estimated $1 billion.